The knee is made up of three compartments: patellofemoral (compartment in front of the knee between the knee cap and thigh bone), medial compartment ( inside portion of the knee joint), and lateral compartment ( outside portion of the knee joint). Unicompartmental knee replacement is a surgery in which only one compartment of the knee is replaced with a prosthesis. It is also called a partial knee replacement. Unicompartmental knee replacement is a surgical option if arthritis and pain are confined to a single compartment of the knee. Better overall range of motion. More natural feeling of the knee. 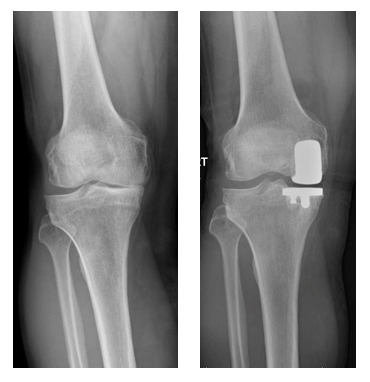 Below are before (left) and after (right) X-rays of a fifty-eight-year-old man showing severe knee arthritis localized to the inside part of the knee only. He was treated with a partial knee replacement.